We have heard nothing new about any of two upcoming instalments in Assassin's Creed series for a long time, but today, fortunately, we are ready to tell you some fresh Assassin's Creed: Unity news. Thus, yesterday, one of Twitter’s users with CriptAssassini nickname published a leaked Assassin's Creed: Unity picture in his account. 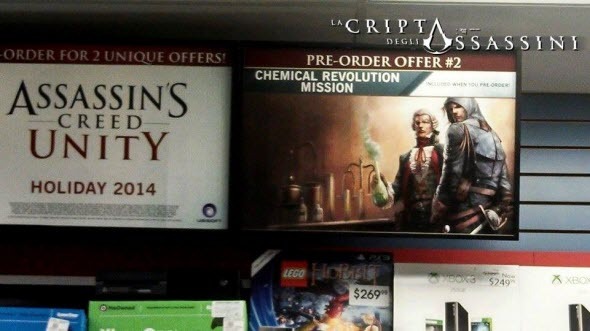 This poster, which had appeared on Gamestop site, shows us one game’s pre-order bonus - a mission, entitled Chemical Revolution. Besides the name of the new job, the fresh Assassin's Creed: Unity picture lets us see the project’s main hero and a chemist, who, apparently, will be helping the protagonist. A lot of journalists have made the assumptions about the personality of this chemist, and, according to their suggestions, it can be Antoine-Laurent de Lavoisier - one of the most distinguished scholar in 18th century and the person who considered to be "Father of Modern Chemistry". It’s quite possible that Lavoisier will be as important for the protagonist of Assassin's Creed: Unity, as Leonardo Da Vinci was for Ezio Auditore da Firenze in Assassin's Creed II. But that’s not all. As you can see on the screenshot above, this mission is the second thing offered as a pre-order bonus for the gamers. And which is the first one? So far, unfortunately, it’s unknown, but we hope that Ubisoft’s employees will tell us more about the game and its pre-order bonuses very soon - at E3 expo. Did you like such Assassin's Creed: Unity news? Do you anticipate the launch of this action-adventure? Let us know in the comments below.